Prior to 1874 this Virgin and Child was in the Sciarra-Colonna collection in Rome, where it was seen by Crowe and Cavalcaselle who included it in their publication on Titian of 1877. The painting remained in that collection until 1874 when Francis Cowper acquired it in Rome. While it was in the Cowper collection it was lent to two exhibitions organised by the Royal Academy in London: the winter exhibition of 1881 and one on Venetian art held from 1894 to 1895. Together with other works from the Cowper collection, it was sold by the executors of Lady Desborough in an auction at Christie’s on 16 October 1953. The canvas was purchased by the London dealers Agnew’s, from whom it was acquired in 1956 by Baron Thyssen-Bornemisza. Following the two London exhibitions of the late 19th century, the canvas was not mentioned again in the scholarly literature until the mid-20th century when it entered the Thyssen Collection. In 1956, the year of its acquisition, it was included by Wilhlem Suida in a Miscellanea on the artist. Both the attribution and the date of the painting have been debated. Suida considered it an autograph work and dated it to around 1520–30. Bernard Berenson did not include it in his list of Titian’s works published in 1957, while Philip Hendy considered it an autograph work of around 1540, publishing it as such in his study on various Italian Renaissance paintings in the Collection. 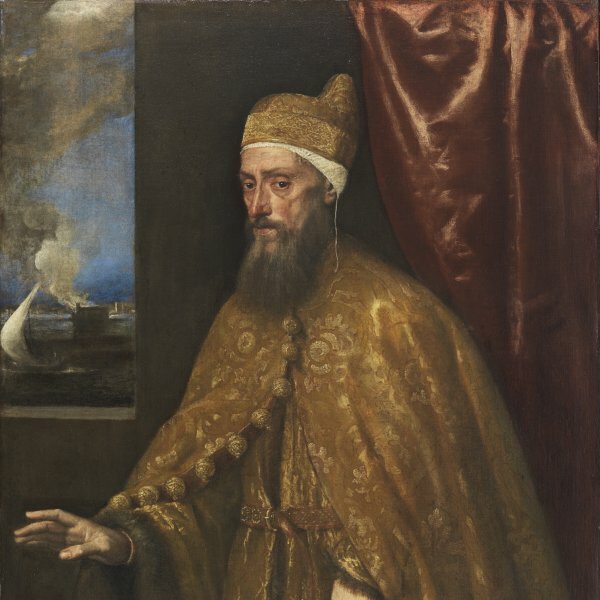 In 1969 Rodolfo Pallucchini also stated it to be an original painting by Titian, as did Harold E. Wethey who considered it difficult to judge due to the overpainting present at that time. In 1980, however, Fritz Heinemann judged its rather naïve style to be the work of Titian’s son and collaborator Orazio Vecellio. Roberto Longhi considered it an autograph work by the artist in a commentary written the year of its acquisition. As Hendy noted, the painting is the smallest known by the artist. 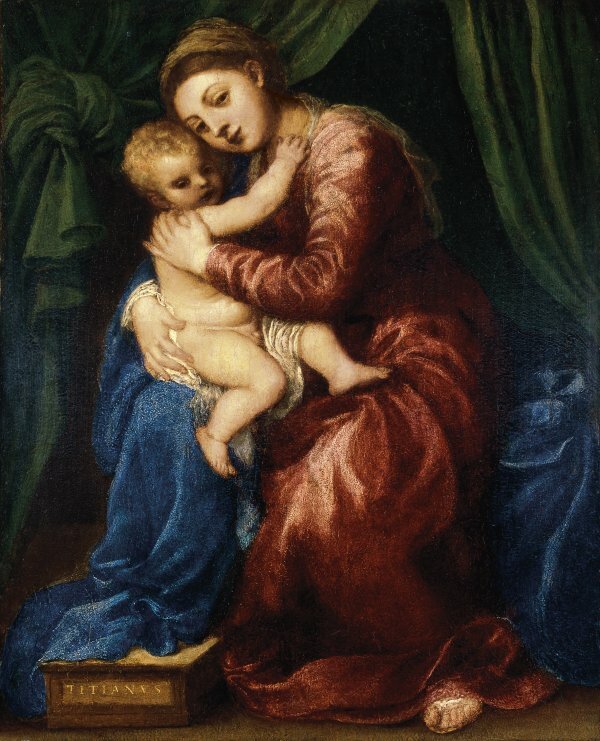 Titian created the background from green curtains, against which he placed the Virgin who tenderly embraces the Christ Child. The use of colour is particularly striking and Titian used a limited range to construct the figures and background, both of which reveal extensive areas of single colours. The intense green of the curtains contrasts with the large patch of blue of Mary’s mantle, which spreads out to cover the chair. Green and blue contrast with the vibrant crimson of her tunic. The Virgin’s pose suggests the Rest on the Flight into Egypt in the collection of the Marquis of Bath while that of the Child recalls Titian’s canvas in the Alte Pinakothek, Munich. A print by Niccolò Boldrini of Venus and Cupid repeats this composition. In 1898 the painting was photographed by Brown while it was in England. For commercial uses (including publications) and advertising, requests must be addressed to Scala Archives Image Library, exclusive agent of the Museum for worldwide distribution of its images and for the management of its rights of reproduction. If the image is to be reproduced, the work must be reproduced in full. Users may only reproduce a detail or cropped section of the work after obtaining written permission from the Fundación Colección Thyssen-Bornemisza. In such cases, the image credits must clearly indicate the word “detail”. The image may not be manipulated, changed, modified or altered in any way. In particular, the reproduction may not be superimposed with any other images or text. The use of images is only granted for private or educational/academic purposes. Use for educational purposes is defined as the non-commercial and non-advertising use of images in presentations, lectures, school or university projects, and academic or research publications of which no more than 1,000 not-for-profit copies are printed. If the images are being used for purposes other than those described above, prior written permission from the Fundación Colección Thyssen-Bornemisza is required. When an image owned by the Fundación Colección Thyssen-Bornemisza is reproduced, all reproductions or the list of photographic credits must include the following: the name of the artist, title, date, © Fundación Colección Thyssen-Bornemisza, Madrid. If the image is reproduced the user must send two free copies of the publication to the Rights Reproduction Department of the Fundación Colección Thyssen-Bornemisza. They should be addressed to: Photographic Archive, Museo Thyssen-Bornemisza, Paseo del Prado 8, 28014 Madrid, Spain. The user agrees to use the image from the website solely and exclusively for the purposes outlined in paragraph 3 and in accordance with these terms. El Archivo Fotográfico del Museo Thyssen-Bornemisza ofrece el servicio de venta y alquiler de material fotográfico de todas las obras de su Colección Permanente, así como de las obras de la Colección Carmen Thyssen- Bornemisza en depósito en el Museo Thyssen- Bornemisza. Scala Archives actúa como agente exclusivo del Museo para la distribución mundial de sus imágenes y la gestión de las solicitudes de concesión de licencias. Como agente del Museo, Scala Archives proporcionará imágenes digitales de alta calidad (según disponibilidad) que les han sido facilitadas por el Museo. Las tarifas se calculan en función de la naturaleza y el tipo del uso propuesto, así como de la disponibilidad de la imagen solicitada. Todas las solicitudes de escaneados o nuevos fotografiados serán revisados caso por caso. Una vez aprobados, se aplicará una tarifa adicional. El re-fotografiado de una obra requerirá un mínimo de seis semanas para estar listo. Para cualquier otra consulta relacionada con imágenes de nuestras colecciones y licencias, puede ponerse en contacto con el Archivo Fotográfico del Museo en la siguiente dirección de correo electrónico: derechos@museothyssen.org.